Yesterday, I replied to a tweep (Twitter peep) seeking advice if there was a presser foot that would make it easier to sew the curves in a Drunkard’s Path quilt. I suggested the sewist look into the a foot I had read about a foot called a Curve Master Presser Foot. For those who aren’t familiar with quilt piecing, Drunkard’s Path is a mainstay design of historical quilting. The block is a simple two-piece block; the complexity is that it is a joined convex and concave seam. Much like a princess seam in garment sewing. And in both cases, you don’t want any puckering. Full disclosure: I’ve never used this presser foot, so the information is based on what I’ve been able to read. This presser foot is supposed to automatically put the ease in to the “mountain” curve, eliminating pinning. The guide is set for the quilter’s standard of a scant 1/4″, so if you’d have to grade your seam down on a garment…although I just finished a masterclass with Japanese designer Shingo Sato where we only used 1/4″ seams. I think the Curve Master Presser Foot may be my next presser foot purchase! Here’s a video of how to use the Curve Master Presser Foot. If you’ve used this foot, leave a comment to let me know if you recommend this foot or not. Part of the fun and benefits of the American Sewing Guild is sharing information and experiences with other members, so please do leave a comment! Baseball season has opened. The White Sox home opener is today; the Cubs opened at home last week. Baseball is the signal of warm weather. 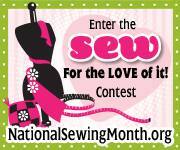 Do you go outside to enjoy the weather or do you stay inside from the sun and heat to continue sewing? You can do both with Stitch N’ Pitch! Stitch N’ Pitch is the perfect outing for those (like ME!) who love baseball and the needlearts. Stitchers of all kinds and all levels converge upon major and minor league games to sit and knit, crochet, embroider, cross-stitch and needlepoint. I can’t imagine bringing a pair of pants to mend or doing couture beading…hmmm, I wonder if I can get a needlefelting needle in? On June 5, 2010 Stitch N’ Pitch set a new Guinness World Record for “Most People Crocheting Simultaneously” at Mets Citi-Field with 426 crocheters! Way to go! Stitch N’ Pitch will be at U.S. Cellular Field to watch the White Sox on Sept. 10th, as informed by their tweet. No word yet of a Cubs date. Anyone want to join me in attending? If you aren’t a big baseball fan or if you prefer a more relaxed setting, try a minor league team. Check Stitch N’ Pitch’s minor league team schedule to find one near you. If you’ve never been to a minor league game; it’s a much different atmosphere.